I know I learned to play chess when I was young. My dad taught my brother and me, and we played quite a lot, as I recall. However, I have not played in years, and while I have a vague recollection of the way the pieces move on the board, and checkmate, I don't remember much beyond that. I never learned any cool chess moves like the Wronski Feint (okay, that's a Quidditch move, not a chess move, but you get the idea). I did some quick research, and learned that the game of chess began, in some form, about 1500 years ago - in India! From there, it it spread to Persia, then to Arabia, and then to Europe (at least according to Wikipedia). This year in history we're studying the Middle Ages, and chess is part of that. Knights were expected to know how to play chess, and it was a popular game with nobility. 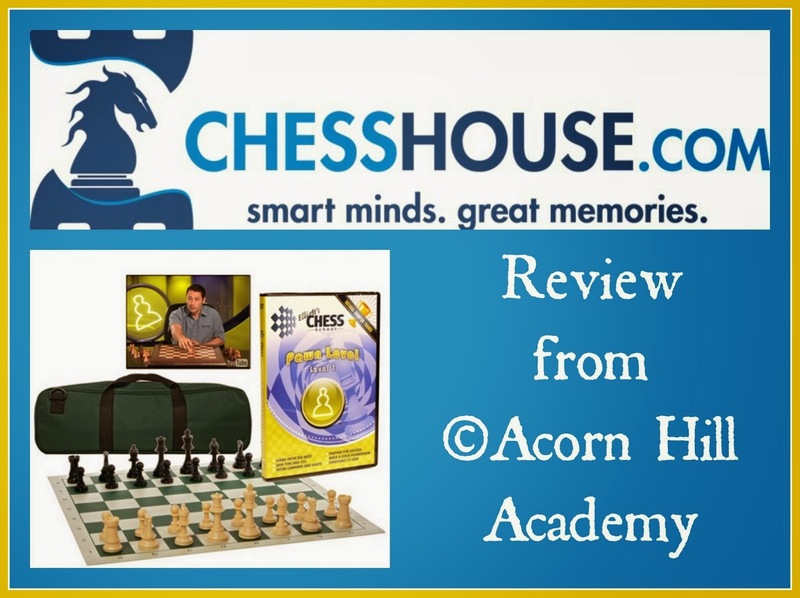 We received the opportunity to review the Starter Chess Learning Kit from Chess House at the perfect time! The kit includes a vinyl mat that rolls up, regulation-sized plastic chess pieces, the Pawn Level DVD (the first level in Elliot's Chess School), and a handy carrying case to keep it all together. The DVD lessons are taught by Elliott Neff, a National Chess Master. He even plays chess blindfolded. I have no idea how that works at all, but his lessons are clear and easy to follow. He makes the game sound simple. For each segment of the DVD, there is a corresponding practice game in the liner notes. (A friend of mine told me about the liner notes. I don't usually read liner notes. These are VERY HELPFUL, so if you get the DVD, don't skip them!) The lessons present how each piece moves, and the practice games have you practice moving the pieces from the lessons, without using all the pieces on the board. For example, when you learn about pawns, you can then play the pawn game, in which each player uses only their pawns to try to get across the board. I learned a lot from the lessons and practice games. As I mentioned, I did learn to play chess when I was younger. However, I did not know the pieces are worth points, or that the rows and columns are called "ranks" and "files." I should have known that each space is labeled with a letter and a number, because I've certainly read books and seen movies about people playing chess through the mail, but I never thought about it until we watched the first lesson. My girls learned a lot, too, and because Mr. Neff's lessons are taught so well, they had no idea how much they were learning. Each lesson segment is short, which is great, because they're not overwhelming. 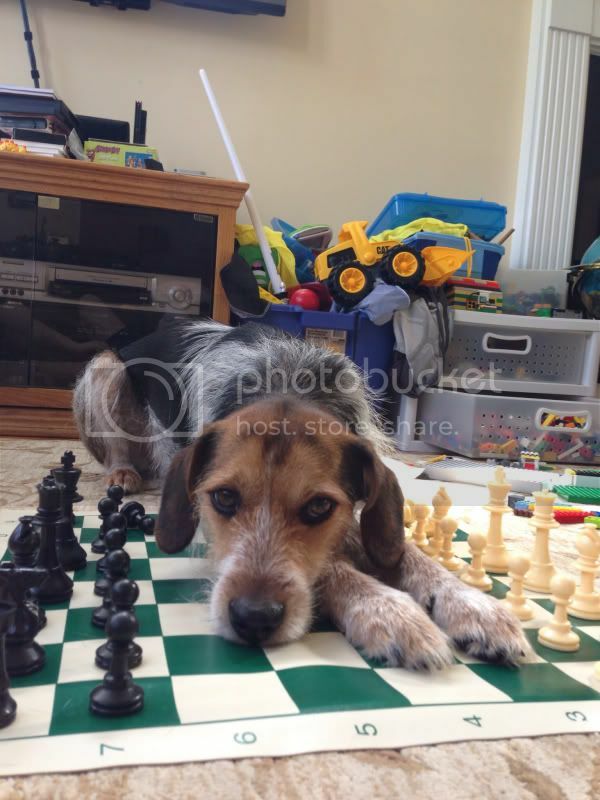 One of the reasons I haven't pursued chess in our family is the idea in my head that it's complicated. These DVD lessons showed me that is not true. It makes a huge difference, learning from someone who has mastered the game and is passionate about teaching people to play, rather than trying to teach ourselves from a book. The girls and I had a lot of fun learning to play chess with this DVD. We watched one segment, played the corresponding practice game, and waited until the next day to watch the next lesson. Even some of our furry family members joined in the fun! The practice games really are excellent for building knowledge and confidence. We will definitely continue with this series of DVDs. This starter kit is labelled for all ages, child through adult. I am not sure what the best age is to begin learning chess. I read that children can learn as young as 3, but my 6 year old is not interested yet. He did, however, teach me to play "Battle," which involves him knocking over all my pieces and making rules so I can't knock over any of his. Ha! I could probably teach him how to play the game, but I think I'll wait until he wants to learn, so it's fun for both of us. All that to say, there is no specific age when a child is "ready" to learn chess, and each child is different, so you'll want to determine for yourself if your young one is ready or not. 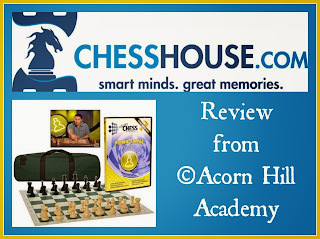 This Starter Chess Learning Kit is available from Chess House for $39.95, which is a great deal for everything included!